Matrox Convert DVI Plus lets broadcasters easily and economically incorporate content from computers, iPads, and iPhones into news programs. It is also the perfect appliance to drive projectors and large displays at live events and in houses of worship. Genlock to an SD analog black burst (bi-level) or HD tri-level genlock source. Use horizontal and vertical timing offset controls to align your video output relative to your external genlock source to compensate for cable delays within your facility. Adjust the hue, chroma, saturation, and brightness levels of your output signal. 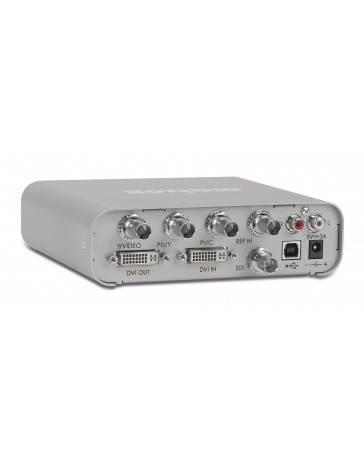 Matrox Convert DVI Plus can be used with any progressive DVI device as your input source such as a medical or industrial camera, an iPad or iPhone, or a computer at any resolution. It’s a DVI to SDI converter. Once configured using the unit’s PC- or Mac-based user interface via a USB connection, the control computer can be disconnected. Thanks to its input detection feature, Matrox Convert DVI Plus is ideal for conference environments, where presenters come up to the podium with their laptops just a few minutes before their presentations. Regardless of the input resolution, Convert DVI Plus will automatically output at the desired, pre-programmed resolution. Matrox Convert DVI Plus accepts your computer’s stereo audio output. 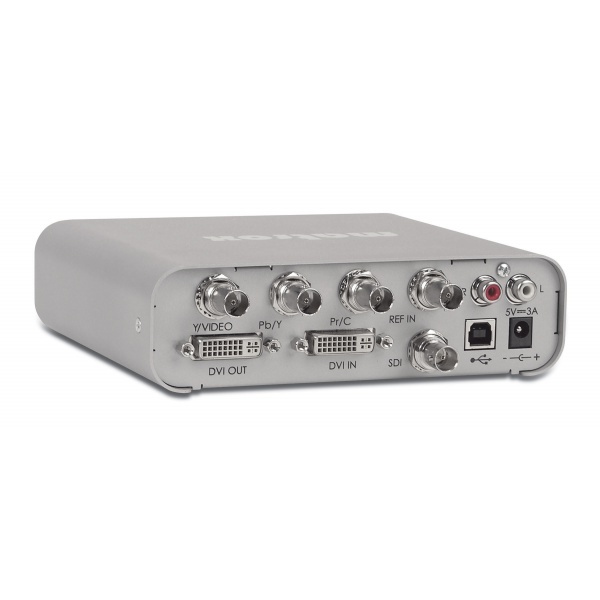 The audio is routed to the RCA audio output of Convert DVI Plus for monitoring and is embedded into the SDI signal. Audio and video synchronization is maintained throughout the hardware processing chain. Matrox Convert DVI Plus provides a full complement of outputs including HD/SD-SDI, HD/SD analog component, S-Video, and composite. Your choice of analog output and the SDI output are simultaneously live. In addition to its digital and analog outputs, the user interface of Matrox Convert DVI Plus provides a live preview window that can replace a cumbersome external preview monitor. Over-the-shoulder graphics for news programs and lower-thirds or score tickers for sports broadcasts are easy to create from computer content. You simply scale and position your content to appear exactly where you want it on your broadcast output using the live preview window. You select background key colors from a large palette including super-white and super-black. Many newer computers and devices such as iPhones or iPads have HDMI outputs rather than DVI outputs. Matrox Convert DVI can be used with these devices via an HDMI to DVI adapter that you purchase separately. In the case of iPhones or iPads, you will also need an Apple Digital AV Adapter. The graphic overlay feature lets you add a custom logo or graphic to the Convert DVI Plus output. You can display any PNG or TGA file with alpha over a YouTube video, a Skype conversation, or a Google Earth map, for example.